Ok…I was cruising around the news today, and found a religious article about the signs Christians use to attract people to the church. So, I thought I'd just post a bit, and you tell me what you think. We'll try and rate each one, and then leave the discussion for the readers. I'd love to get your take on these. Um? I don't get it. But I'm sure I'm not going to let Satan be the King of my heart. So, what do you think? As I drive the country, I see these things all the time. Sometimes I drive by, and sometimes I stop and pray. Sometimes I laugh, and sometimes I just shake my head and wonder, "Did someone really spend time thinking that up?" I guess the real question of the day is, When did the church think it necessary to advertise for people to come? Why do we have to have the wittiest sign in town to attract people, or get people talking? 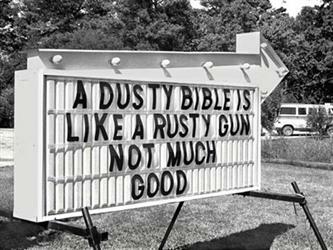 Isn't the gospel enough? I'm not advocating we don't have a good laugh. (if that's what these are intended for) So if it's one big joke, let's keep on thinking up witty slogans. But if we're really trying to simplify the gospel into a wise crack, is there something to that? What I do know is, I'm laughing at some of these today. Some out of the fact they just make me laugh, and some out of …..WHEW! Previous I just got this from a K-Co Kamper. Thought you might get a better picture of what we do. 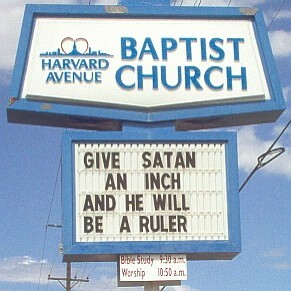 go to http://churchsigngenerator.com/ and make your own church sign say whatever you want! I actually like the “scary” one. Yeah, it’s scary, but it’s funny in a “let’s mock it” way. A second would be the git r done one. 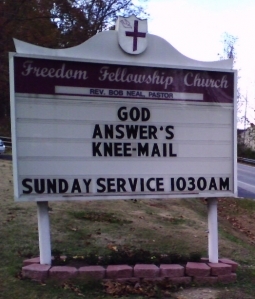 I didn’t like the knee-mail, because it was too kitchsy and the “give satan an inch one” is just too doom and gloom. “I kissed a girl and I liked it. And then I went to hell.” I liked that one. 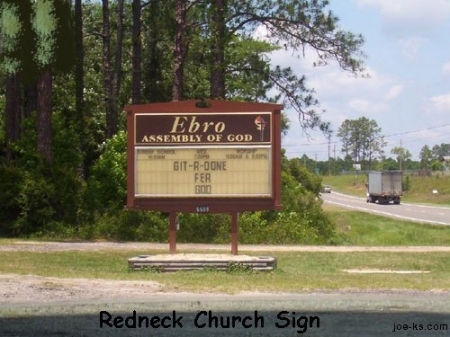 I like the “git-r-done” one the best. 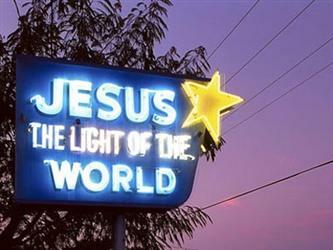 We used to pass this sign every time we drove to visit relatives! 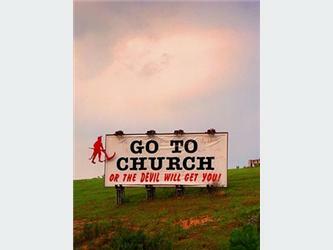 It definitely kept me going to church as a child, at least until the real reason for going dawned on me! I still think it’s a hilarious sign!